Heat oven to 350°F (325°F for dark or nonstick pans). Grease or spray two 9-inch round cake pans. Make and bake cake as directed on box for 9-inch rounds. Cool 10 minutes. Run knife around sides of pans to loosen cakes; remove from pans to cooling racks. Cool completely, about 30 minutes. Refrigerate layers about 45 minutes for easier handling. Trim off rounded top of one layer. Slice each cake in half horizontally to make a total of 4 layers. Reserve untrimmed cake layer top. In chilled medium bowl, beat whipping cream with electric mixer on high speed until stiff peaks form. Place 1 cake layer bottom, cut side up, on serving plate. Spread 2/3 cup whipped cream over layer to within 1/4 inch of edge. Slice 1 banana; arrange on whipped cream, overlapping slices if necessary. Drizzle 1/4 cup butterscotch caramel topping over banana, spreading to coat slices. Sprinkle with 2 tablespoons pecans. Repeat with second and third layers. Top with reserved cake layer, rounded side up. Frost top of cake with remaining whipped cream. Spoon remaining butterscotch caramel topping over whipped cream. Swirl caramel into whipped cream with tip of knife. Cover; refrigerate about 2 hours or until ready to serve. For best results, serve cake the same day. Store covered in refrigerator. To toast pecans, bake uncovered in ungreased shallow pan at 350°F 6 to 10 minutes, stirring occasionally, until light brown. 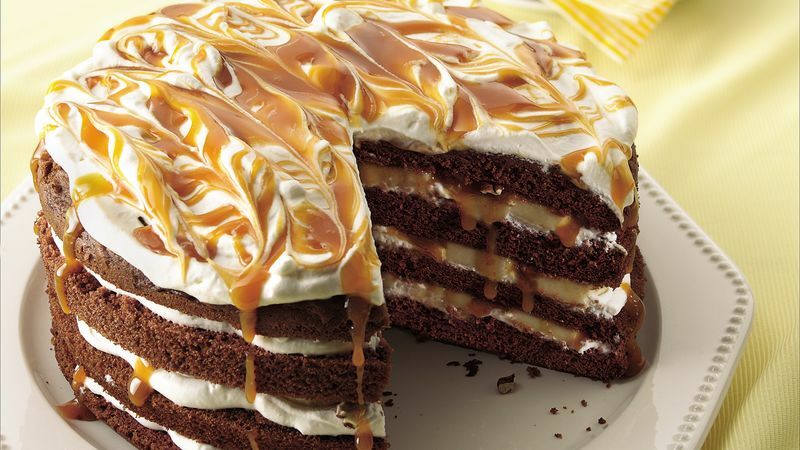 For a jazzy presentation, drizzle caramel topping on each plate. Center a slice of torte on each plate, place a dollop of whipped cream next to it, and top with a pecan half.